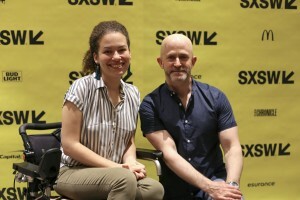 I met with director/subject Jennifer Brea on Tuesday, March 14, 2017, at SXSW, to discuss her directorial debut, the feature documentary Unrest (which I also reviewed), which premiered at Sundance. In it, she chronicles her journey from active and energetic, young, newlywed Ph.D. candidate to exhausted, completely debilitated, bedridden patient, suffering from myalgic encephalomyelitis (or ME), known colloquially as chronic fatigue syndrome (CFS). It’s a highly personal movie, and incredibly life-affirming as it shows Brea slowly pick herself up from an understandably deep despair and begin to rebuild a semblance of the life she had expected. Here is a condensed digest of our conversation, edited for clarity. Hammer to Nail: So, let’s start with today, in 2017. How are you managing your chronic fatigue syndrome these days? Treatments? Periods of remission? How are you feeling? Jennifer Brea: I’m doing pretty well, I think. It’s taken a long time and it’s been a long journey, but I’ve learned a lot about the limitations of my body and how to live within them, and so I know exactly what I can and can’t do. (laughs) And sometimes I misjudge, but it’s allowed me to construct a life that I can live within, and so that’s helped a lot. And then I’ve also had access to treatments that, I think, most people do not have access to, and it’s been a combination of prescription drugs – that are really helping – and just the endless journey of self-experimentation that I document in the film, and all of the things that I’ve learned from my patient community that have helped me to be much more well. So, I’m not bedridden anymore. I use a wheelchair when I leave my house, but…I can leave my house and be a part of the world and that’s really a miracle. I’m grateful for that. HtN: When you say you have access to treatments that other people don’t, is that just because of the exposure with the film, or is it because of where you live? Do you have access to treatments at Princeton? JB: I actually live in Los Angeles now. JB: I just moved, after the film. It’s a combination of things. Some of it is just having the education to relentlessly search, and the ability to do that, in part because of my husband, Omar, and having that family support, as well as having really great health insurance and the ability to pay out of pocket, as essentially you need to do with almost any of the 10 experts…(laughs)…in the country who treat this. And living in states where there is someone. A lot of people…in most of the country there’s not a single doctor who specializes in this disease within the state, so it’s geography and a whole combination of things. And I also think that having had the scientific training – the statistical training – to have a way of thinking and approaching how to try new things. So it’s all of that combination. HtN: Speaking of the experts, we meet Ron Davis, in your film, who has a child with CFS, as well. What is the status of his research? In the film, you show that he is not getting the money that he wants, so how is he doing in his pursuits? HtN: You can go into the science a little bit. HtN: That’s good! That’s progress. JB: They don’t know what it is, yet, but yes, it is. And that’s really exciting, because … there’s a thing. So I think they’re very close, and they’ve been testing basically every known … every FDA-approved compound, to sort of see what alters that biochemistry, and what might be a cure. So I think they could make a lot of progress very quickly if there were more support. I’m hoping that the campaign that we’re building in the film can usher in greater awareness and support that. HtN: That’s great news! So, chronic fatigue syndrome is definitely now viewed by the medical community as myalgic encephalomyelitis? Is there a real consensus now that the two are one and the same? JB: Yes, the official term now is ME/CF, but actually ME is the official … it’s what the World Health Organization calls it. It’s been the name of the disease since the ’70s. It’s the original name, and it was really out of that Incline Village outbreak that we show in the film that this name and concept of “chronic fatigue syndrome” developed. And I think a part of it was just that there had been these outbreaks – 70 or so, documented in medical journals, over the course of 50 years – and every time there was an outbreak, people would forget, over and over again, and so the disease would kind of come up and then disappear throughout the history of the last century. So, it’s not a new disease, by any stretch, and ME is the old name, and I think it’s the name by which it is more commonly called in Europe, and it’s also what patients prefer to call it. Why would you use a name that stigmatizes yourself? (laughs) And it’s also grossly inaccurate. JB: But the government calls it ME/CFS, so that’s what we call it, too. HtN: OK. Thanks! Let’s move away from the science, and talk about your filming process. Mostly bedridden as you were, how did you make this movie? I know that we see other people helping you in the film, but particularly shooting internationally, who handled the set-up for the long-distance interviews, and getting footage in places like Denmark, where you tell the story of Karina? JB: So I had a number of amazing collaborators, and basically my strategy was that I found the stories…I knew that I wanted to tell an international story – a global story – in part because I think it’s really easy to…I wanted the film to travel…I think it’s really easy, when you see a foreign story, whether you’re a Dane, watching something happening in the U.S., or someone in the U.S. watching something happening in the U.K., to sort of distance yourself and say, “That’s what happens in other places. That’s not us.” I wanted to make it really hard to say that, because one of the things I found, after I first got sick, was that the [fundamentals] of your condition and life changes are the same no matter where you live. And so that was the motivation. And then in terms of the process, once I chose these stories, I went about trying to find documentary filmmakers, locally, who could collaborate with me and help me to shoot. It was a struggle, because I had never made a film before and I didn’t know a single filmmaker, and so…(laughs)…it was a process to find the right people. And then in terms of the technology, I had been introduced by one filmmaker to the iPad teleprompter – a sort of poor man’s Interrotron – and realized that, although most people use it to film from the next room, I could essentially be in my bedroom and conduct interviews with anyone around the world, and have them see me in front of the camera, as though I were there, or at least create that sense of intimacy that you feel in the interviews. So that was a big part of it. And then the second piece was getting the capacity to live-stream, through the internet, from our A camera to my computer at home. And you see that in the film, in a few moments where I’m actually watching what’s being shot live across the world. And so, it was both a way to help me to monitor what was happening on set, but also just to help me help me feel like I was traveling again and to open the world up to me and bring me to places that I’d never been before, in that moment when I couldn’t leave my bed. That was, for me, the greatest gift of this experience, because I’d always been someone who loved to travel. To be able to do that again, through film, in real time, was incredible. HtN: Did you have to set up something more reliable than a Skype connection, to do this? JB: Yeah. It’s called a Teradek. So, the interviews were on Skype, but the camera-stream was using a Teradek, which is a kind of mobile Wi-Fi or mobile solution to satellite that I think a lot of local TV, and high-school television, shows use. It wasn’t as reliable as I wish it would have been, and I’m always thinking about better ways to do that, so I can make more films, but it streams HD from the camera, with like a five-second delay. HtN: Wow! So, how did you find your other subjects? I think they’re all really interesting. I love the story of Leeray, particularly as it plays out, with her later reconciliation. It’s just beautiful. But how did you go about finding them? JB: There’s this really vibrant online community that I had found, when I first got sick, and it was through being a part of it, learning about some of the stories that people were sharing. So we all knew about Karina, even though no one in the media was reporting it. It was a big story within this online community. And then, after our Kickstarter campaign, before we started shooting in earnest…I did this big Kickstarter campaign, that was massive, and we raised over $200,000 and that was how I was able to create a film that was more ambitious than I had initially set out to do. And through that, kind of grew the community around the film, and did a kind of open call and got hundreds and hundreds of emails and stories. And there was just something about Leeray’s story that really called out to me, and for me it was about the fact that I was really struggling with this idea of family. My husband and I had just gotten married and there was a lot of conversation, online, among patients, about whether, if you’re disabled, is it moral to have children, and what does life look like in a family. And so I was really drawn to that story, and in part because they don’t have a lot, but they have family, and they’ve figured out a way to make it work. And so I knew I had something to learn there. That really was kind of how I chose every story: there was something there that I needed to learn, that was kind of calling to me, on a very personal level. So that was both how I chose the stories I wanted to highlight in the film and then also, in the film, that was how we narratively connected them, through that personal inquiry. HtN: Your husband, Omar, is such an integral part of the film, and both you and he share really personal moments. How’s he doing these days? You said you just moved to Los Angeles. I’m curious, since he’s a character, to know how he is. JB: (smiles) Well, he still lives in Princeton, and he’s a professor, and we meet in Copenhagen…(laughs)…next week, when I do the European premiere there. He’s doing really well. It’s hard; I can’t live on the East Coast, because I have something called mast cell activation disorder, as well, which a lot of patients with ME have, so it’s really hard for me to live on the East Coast. But he’s doing really well, and I think the fact that I can now live more independently has been a blessing for both of us, and he, through the film coming out, has also felt, in this profound way, not only that he has been able to help people by sharing his story – because the reactions, to him, from the patients and caregivers who’ve seen the film is so strong and so beautiful – but I think he also feels that now he doesn’t have to hide anymore. So when people ask him how he’s doing…there’s a secret life that I think a lot of people have, whatever that means – we all have these sort of secret lives…and for him, I think it’s been this kind of unburdening, to be able to say, “This is actually what it’s like,” and to have people just know, and not have to pretend that it’s any different. HtN: Well, Jennifer, thank you very much. It’s a beautiful film. Glad I got a chance to talk to you.